8840 Lookout Mountain Avenue | Brian Ades Legacies of L.A. Commissioned in 1958 for Roy and Carol Mills and their children, 8840 Lookout Mountain was an engineering marvel of its time. In fact, the Mills Residence received the first Architect-Builder-Crier Award as an unusual hillside dwelling. Built 1958 | 1,543 Sq. Ft. Ever since his interest was piqued by a required seventh grade drafting course, Polsky told Medium Magazine in 2005, he never considered doing anything else. He went on to study at the University of Nebraska College of Architecture. 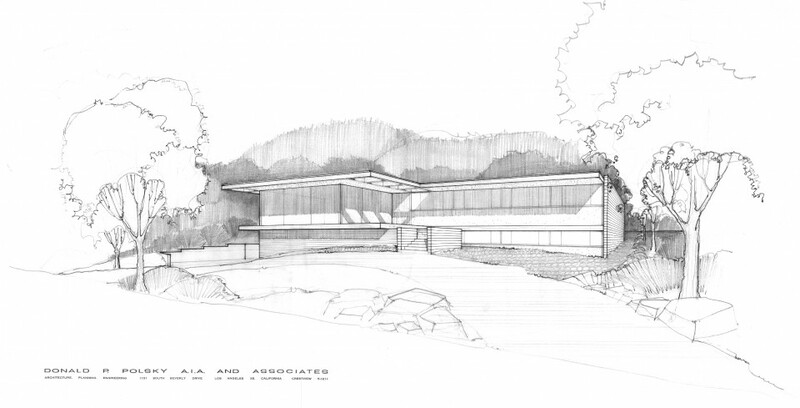 After serving in the US Air Force from 1951-53 he set out to “work for the best practicing architect he could find,” and went knocking on none other than internationally-renown Richard Neutra’s door. As Polsky recalled, he was persistent and unrelenting until he gained an interview with Dion Neutra, Richard’s son, and was hired shortly there afterwards. From 1953-56, Polsky served as job captain for the Neutra Architectural firm. It was during that time that he developed a sophisticated Modern aesthetic. In 1956, Polsky struck out on his own and is credited with few but significant projects in Southern California. Just as his mentor, Neutra often had been, Polsky was clearly inspired by the surroundings at 8840 Lookout Mountain. At the time it was built, the Modernist design of the Mills Residence was the exception, not the norm, in the Laurel Canyon Neighborhood. After a return to his home state of Nebraska, Polsky’s designs, that emphasized on clean lines, simplicity, and efficient use of space, translated well to Omaha. Since then, he has been credited for establishing Modernism in the Midwest. “We were green before its time, we put in a lot of insulation, we shaded our windows, we oriented things towards light, and brought light into the home. We used insulating glass, we planted trees to give us shade, we broke the wind from the north, and we worked with the client’s budget on the configuration of the site,” Polsky said in an earlier interview. Polsky noted that because his clients required that his projects be different from previous design, he had taken inspiration from such uncanny items as Japanese pagodas to origami paper folding. An innovator, he is also credited with being a pioneer of the design-build concept. In 2002, he was awarded the Harry F. Cunningham Gold Medal for Architectural Excellence in the State of Nebraska from the Nebraska Chapter of the American Institute of Architects. The following year, Polsky was elevated to fellowship in the AIA–one of the highest honors bestowed upon architects. As recently as 2014, Polsky was awarded the Distinguished Alumni Award for Excellence in Architecture by the University of Nebraska College of Architecture. The Mills Residence is a 1,543 square foot house carefully designed at the crest of a 9,460 square foot lot. When Mel Moss, the second and current owner of 8840 Lookout Mountain first moved into the home in 1979, much of the original integrity of the home was still intact. Moss eventually bought the home in 2004 from the Mills family. Many of the original appliances and fixtures remain. Twentyone feet of counter space afforded luxurious indoor/outdoor entertaining with dramatic views from the deck just steps away. Moss was diligent not to destroy the integrity of the house. He consulted Donald Polsky, FAIA, himself, and any original plans that he could gather when he had considered a remodel. Mel Moss, (right) had the pleasure of meeting Julius Shulman, (seated left) at the photographer’s book signing. Shulman’s book, Modernism Rediscovered, includes photographs of the Mills Residence. Read more about the history of Laurel Canyon on our 8917 Appian Way , and 8626 Skyline Drive Blog posts. It is all true except the one time spieling of my name ending once with a “ski”. And the house next door…plant vines. It will cool the house next door. Originally the mills had 3 25 foot wide lots. I think they were plotted for vacation houses or cabins. The street could be made twice as wide so the car port was built on a revocable easement. Who put all this together and how long did it take? So glad you enjoyed our article. We are big admirers of your work! We write about significant homes and neighborhoods in Los Angeles. We like to get the full story and dig up little known history. This took about a week or so to gather. We usually and try to write a couple of these pieces every one to two weeks. It’d be great to hear more about your fascinating career!